Since 2008 or 2009, I have heard the expression “worst recession since the Great Depression” more times than banks have asked for another bailout. I got tired and fed up by that constantly repeated statement because as little as I know about the Great Depression, I know that it was grim. The current “financial crisis” ain’t nothing in comparison. To get a feeling for what the Great Depression was like, I turned to a work of fiction. 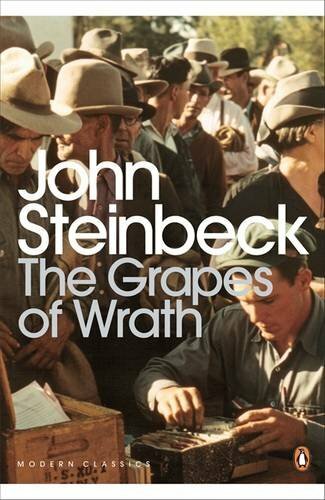 Not any work of fiction, but one which John Steinbeck wrote based on actual research during the Great Depression: “The Grapes of Wrath”. By the second chapter, I was completely gripped already. The description and the development of the characters, their slang, the harsh material environment, the close-knit family holding together, the destitution, it all comes to life. This book is better than any film could be. The book follows the Joad family, a family of farmers in Oklahoma who had their land repossessed by the bank after the Dust Bowl and a bad harvest. Tom Joad, one of the sons, just got out of prison and when he comes home, his folks are gone. They didn’t bother to write and tell him about their plan to go to California, but he catches up with them in time. The whole family, three generations, get on a truck and drive westward. They are not the only ones, and lacking food, money, fuel, it’s not an easy journey. They lose some of their family members on the road, some due to death, some due to desertion. The fatalism with which the parents accept that one of their sons won’t join them anymore symbolizes that the parents don’t have the strength to convince their son to stick with them, because they themselves don’t know what will await them and are already losing hope. Once in California, after many losses and sacrifices, it is not the promised land, but a land of exploitation. A few orchards can pick among hundreds of thousands of laborers. Wages are not even minimum but minimal. 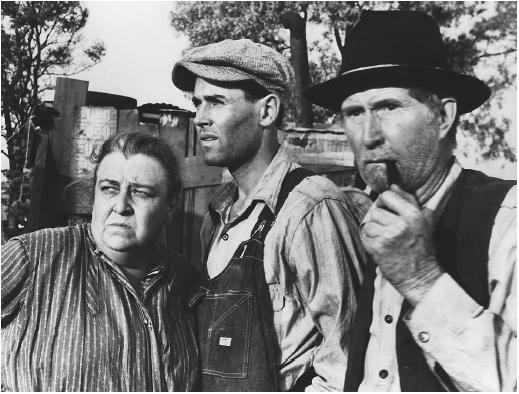 “Grapes of Wrath” is not only a dramatic yet exemplary story of one family. It touches on philosophical concepts about the nature of corporations, about belief, about collectivism and community. When the farmers are driven off their land by a tractor driver hired by the bank, the farmers first think about killing the tractor driver or whoever is responsible. No, you’re wrong there – quite wrong there.The bank is something else than men. It happens that every man in the bank hates what the bank does, and yet the bank does it. The bank is something more than men, I tell you. It’s the monster. Men made it, but they can’t control it. The tenants cried, Grampa killed Indians, Pa killed snakes for the land. Maybe we can kill banks – they are worse than Indians and snakes. But soon, the farmers and the tractor driver engage in a discussion about banks and corporations. Death was a friend, and sleep was Death’s brother. The characters with their unique slang and the wisdom behind it will grow dear to your heart. You won’t be able to stop reading. “Grapes of Wrath” will make you laugh out loud at times, shudder at others, and if the ending doesn’t make you cry, then you are not human. An unforgettable book. Get “Grapes of Wrath” on Amazon. Another book by John Steinbeck, which I greatly enjoyed. A BBC documentary about John Steinbeck. This entry was posted in Books, Economics, USA and tagged literature. Bookmark the permalink. I can reassure you that one of the maxims from that book is still true. Some of the poorest people down here in Ohio have been the ones to go furthest out of their way to help us. And charity is far more obvious and far more personal (people dealing with people, rather than just receiving boxes and checks). You see the person who helps you, and you see the person you help. I know I gripe about Ohio quite a bit (mostly in fun, somewhat in truth), but I’ve met better people, more honest and open and willing to help type of people, than I met in all my dealings with charity in Chicago. Going to have to re-read this book now… something in the way you described it struck a chord, and so much of it seems pertinent to what is currently transpiring. Great post. Yes, this year was a good year to read “The Grapes of Wrath”. I am almost glad that I hadn’t read it earlier, except for the few excerpts I had read in English class decades ago and which instilled a love for the word “ain’t” in me. Love your dissection of this classic. Makes me want to download and read it this afternoon. In fact I think I will.